FilmLand Empire: The Stuff: Are You Eating It... Or Is It Eating You? The Stuff: Are You Eating It... Or Is It Eating You? 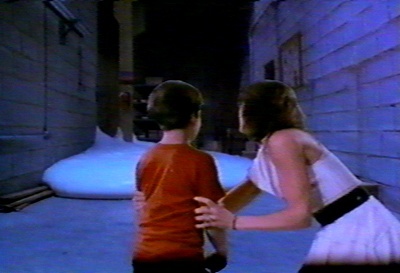 Plot: Two miners find a strange while milky substance oozing out from the ground. They proceed to taste it (as you do) and find it strangely delicious, addictively so even. Fast forward a few months and the "Stuff"'s craze/crave is sweeping across the USA, being sold as a delicious desert. But the Stuff might not be all that it seems, and its true nature has got an icky surprise in store for those addicted to it. And you thought Coke Zero was bad. The Stuff belongs to an 80's sub genre, the substance horror, just like the Blob, Street Trash and more loosely Brain Damage, a trend which saw sub David Cronenberg directors experiment with the human body as if it was some bright playdo. I have to confess I have only seen one film of director Larry Cohen, Q, about a giant flying snake in New York, which had a very faint low budget charm but dragged on terribly, with zero sense of tension. And no matter how much some can enjoy the alternative charm of his less than obvious talent, the one thing he cannot do at all is pacing/editing, a weakness which is apparent in this film too. The Stuff crams what should have amounted to at last half an hour of exposition in about three minutes, from the discovery of the stuff to its mass marketing in the USA, so much so that I thought the DVD had just skipped several scenes. Then very little happen in the next hour, showing what has to be the worst sense of pacing and editing I have ever seen. Building up tension is not about just accumulating shocking scenes one after another, it also creeps up in the quieter scenes in between, but here we have very little of this. It doesn't help that lead actor (Michael Moriarty, already displaying his inept acting skills in Q) constantly looks like he's just wandered into the set as if it was a local bar, unaware of what is going on in the story and with a perennial air of mild surprise. The trailer was amusing enough, but The Stuff never reaches the schlocky heights of that other subtance horror classics, The Blob. That was fast paced, funny, and incredibly gory. Besides, The Stuff is not all that gory at all, with very few notable scenes bar a memorable and drawn out one including a slow head expansion then explosion as the Stuff has reached maturity in his host within its parasitic cycle. Throw away those greens and eat your Stuff! There is also a section reminiscent of Invasion of Body Snatchers that shows a family, whose mind have been taken over through their Stuff addiction, trying to coerce their reluctant younger son to give in and gulp the parasitic treat. Those genuinely unnerving scenes give us a glimpse of what the Stuff could have become in more capable hands. And a few amusing scenes show The Stuff's invasion in a bigger scale but there is not a budget to match to make them work. This feels like such a missed opportunity as the premise is brilliant (and not quite as far fetched as it might seems, several parasites found in nature are known to be able to control the mind of their hosts). And there is an obvious but welcome metaphor about our addiction to junk food, as well as a shot at the quasi mind controlling, nefarious effects of modern marketing and adverts. But The Stuff just does not have the means of its ambitions. Thinking of The Blob, I have just wondered: Who would win in a fight with The Blob and The Thing? I might try to answer this question in an upcoming post.